Oil prices rose on Monday, supported by reports that an Organization of the Petroleum Exporting Countries-led supply cut would not only be extended into next year but might also be deepened in order to further tighten the market. Brent crude futures were up 25 cents to USD53.86 per barrel. U.S. West Texas Intermediate (WTI) crude futures increased 29 cents to USD50.62. Both benchmarks are up ten percent from early May. OPEC and other producers, including Russia, said that their 1.8 mn bpd supply cut would be extended to March 2018. The deepening of the production cut is also likely to be discussed ahead of a meeting of OPEC and its allies in Vienna on May 25. However, soaring output from the USA is undermining OPEC’s efforts to tighten the market. Goldman Sachs said last week that the US oil rig count continued its surge; some 404 oil rigs have re-entered service since May last year, a rise of 128 percent. US oil production has already risen by 10 percent, or almost 900,000 bpd, since mid-2016 to 9.3 mn bpd. The oil and gas industry is facing a challenging year. Oil prices remain volatile, and uncertainty remains about whether prices will recover from current levels of around USD50 per barrel. Across the upstream sector, companies are considering their next investments, while weighing up how to remain profitable in the current climate. Recently, Wood Mackenzie asked its client base to share their thoughts on a number of key themes to gauge the state of the sector, and the conclusion was that the industry is very cautious right now and risk appetite is low. The upstream sector’s key priorities for 2017 include protecting dividends and strengthening balance sheets. The survey also found that, on balance, respondents expect investment in mergers and acquisitions (M&A), exploration and capital spending to rise this year. However, only 25 percent of the survey’s respondents believe that frontier exploration or corporate M&A will deliver the best returns this year. Uncertainty remains about service costs, with respondents split almost equally over whether or not they will rise or not in 2017. 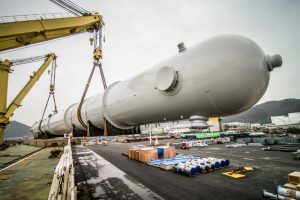 All of which presents a very mixed picture for the heavy lift and project forwarding companies that serve the logistics needs of businesses active in the upstream sector.